Bio 2.0’s mission is to redefine and advance scientific research, training, and innovation through altering scientific institutions, communication, and culture. The Bio 2.0 Foundation, an offshoot of RSI, is our vehicle to promote a new way for scientists to engage each other and the world at large. 1. Scientists work in small, isolated groups, spending an inordinate amount of time doing lab or theoretical work seeking publishable units, which can then be converted into funding. Though billions are spent on research by public and private sources, the demand for funding exceeds its supply, making it very difficult to procure for all but the top 5-10%. 2. The resulting hypercompetitive environment discourages collaboration and prevents young investigators from advancing in their careers. The most innovative or insightful investigators often leave science in frustration. 3. Scientific fraud, theft and carelessness proliferate as pressure to succeed overcomes the ethos of pure science, contaminating the scientific literature with misleading or incorrect information, wasting significant effort and expense. In an infamous study, Amgen scientists found that 89% of major cancer reports were irreproducible. 4. Even when scientists desire to build on the work of others or compare protocols or data with other workers, a lack of common standards and poorly designed tools for exchange impede cooperation. Perhaps the best solution to the funding and associated problems would be to increase the supply of funds to the point where every scientist would have a reasonable (50% or greater) probability of having scientifically sound grant proposals accepted. However, in the real world, funds are likely to remain limited, so more creative solutions are necessary. The Bio 2.0 Foundation proposes an integrated set of creative solutions to these chronic problems based on changing institutional structures, research culture and enhancing the way biologists communicate. The Bio 2.0 Foundation proposes community-based laboratories for young scientists where a small community of investigators shares and pools funds and resources for 5-10 year periods. This is a system that is proven to be immensely successful, creating camaraderie among scientists eager to do great things. Here young researchers are buffered from the requirements of the cutthroat funding system that is biased in favor of established investigators. One of the most successful models for fostering outstanding scientific research is the one pioneered by the Laboratory of Molecular Biology (LMB) at the Medical Research Council (MRC) in Cambridge, UK wherein a community of young scientists with potential is supported by a common fund for a long-term period (renewable 5-year periods) to develop and cultivate talent. LMB scientists have been awarded 10 Nobel prizes over its 68 year existence. The Howard Hughes Medical Institute has replicated a similar organizational structure at the Janelia Farm Research Campus. One Janelia scientist has been awarded a Nobel prize since it’s inception in 2006. Hoechst AG supported a similar organizational setup at the Molecular Biology Department of Massachussetts General Hospital in the 1980s-90s for less than 10 years in return for rights to intellectual property. One of their scientists (Jack Szostak) has recently received a Nobel prize for his work performed there. To truly democratize this process, we propose that such communities of young scientists (COYS) be implemented at the university level or remotely. The Bio 2.0 Foundation will create an exemplary community at RSI as a test bed to empirically explore variations on this idea. The Bio 2.0 Foundation is especially excited about the possibility of remote, cooperative communities of scientists who agree to pool their resources. To this end, Bio 2.0 is building a social network capable of facilitating such interactions as “tea time” at the MRC where scientists can socialize and support one another via a virtual coffee house. Unlike the MRC or Janelia Farm which depend on support from large grantors, Bio 2.0 seeks to create self-sustaining communities by encouraging the development of valuable intellectual property and subsequent commercialization. The pilot test will demonstrate the feasibility of self-sustaining research, in lieu of the standard existing support mechanisms for research. The ultimate goal of this initiative is to inspire the large grantors to create and adopt the infrastructure to support similar communities, which will reform the current system, empower young scientists and benefit society. To facilitate building self-sustaining communities of young scientists (COYS), we are building an eponymous blockchain-based social network, Bio 2.0 which will be an open hub for academic scientists and entrepreneurs, allowing academic discussion on ideas, journal articles, and new technology combined with crosstalk between the academic and commercial sectors. Productive discussion will lead to new technologies that have value to the private sector creating new sources of funding for basic research. Bio 2.0 will act as a virtual coffeehouse/metajournal/data exchange center to facilitate ideas and data exchange while promoting cooperation. Although many private companies are actively pursuing ways to create social networks of scientists that permit the exchange of ideas (Researchgate, Academia.edu, and LinkedIn), our network will be different in that the participating scientists will all be stakeholders in the success of the network and eligible to receive funds from a common pool to support a portion of their work. Use of blockchain technologies allow a simple method to record key data and potentially distribute funds. Any profits that accrue will help sustain the work of the participating scientists both directly as members and through grants from the Bio 2.0 Foundation. A portion of the proceeds will be retained by the foundation to fund itself and make grants to fulfill its mission to cultivate young scientists and improve the interface between biology and biotechnology. A next step. after the realization of a social network for scientists, we will create and establish a prototypical scientific journal to embody our vision. The currency of scientific research is currently the number of publications in well-regarded journals such as Science, Nature, and Cell. Each report in an esteemed journal increases the chance of funding by the large grantors. We and others, such as eLife, hope to reform this process. We would like to revolutionize scientific publication by changing the definition of a publishable unit to allow both smaller units and a better linkage of related work. Alteration of the publishable unit will not only help change what the scientific community considers a unit of currency for grants and promotions, but also encourage scientific collectivism. A significant under addressed problem is the lack of a comprehensive data visualization network of published research. Referential material provided in research papers is usually superficial and inadequate to understand the current progress of a topic of interest. And often, even the greatest due diligence and scrutiny are insufficient to fully investigate an important question, or even a single query. Identifying and then associating areas of concordance and discordance between published reports will help resolve outstanding scientific questions and facilitate scientific review. Updates of a published article based on subsequent work will be integrated and relevant reports automatically linked, in essence creating a dynamic research continuum, reforming what constitutes a publishable unit and addressing the problem of finding meaningful content in the ever-expanding plethora of related published work. The eponymous journal Bio 2.0, will be a blockchain-based, new format journal and also a metajournal. 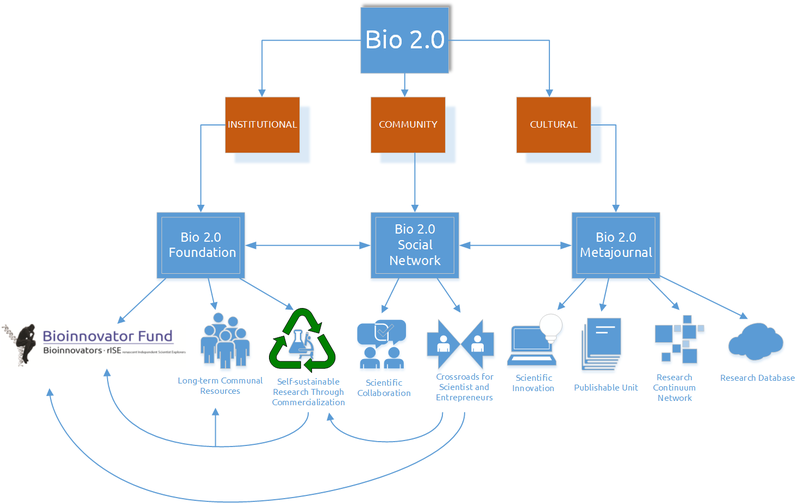 Bio 2.0 implements multiple novel features that include providing direct access to related work, and the possibility of directly using the research continuum network as a basis for related work. Acceptance of the first report will automatically allow updated reports to be added. Significantly new results will be re-reviewed, and then linked to the first report. Bio 2.0 is also developing a common standard to make scientific figures in publications machine readable. We hope that even closed access journals will share the standardized machine-readable version of figures, to improve scientific communication. Moreover, Bio 2.0 will combine peer-reviewed open access scientific publication with a solution to the perpetual problems of funding and commercial development. The journal serves as the nucleus of the Bio 2.0 network where researchers can refine, develop, and translate their work into practical applications with the aid of business development professionals. In addition, all accepted manuscripts have the option of including an editorial commentary on the scientific significance or commercial potential of their work. In a way, Bio 2.0 acts as a scientist’s personal consultant, providing a sense of what academia and industry want, possible strategies for future work, and a way to connect to the movers and shakers in translational research and business development. Commentary from peers and other interested parties will be encouraged both on journal articles and throughout the scientific literature, especially within the context of automatically generated networks of related research reports. This open dialogue facilitates scientists in reaching a consensus on scientific hypotheses and expediting future research. Thus, Bio 2.0 will be a journal and simultaneously, a metajournal. Moreover Bio 2.0 will implement a blockchain-based distributed database for the storage of raw data associated with publications using encrypted file sharing technology with fine grained control of data-sharing to be in the hands of individual researchers. We will integrate this effort with other initiatives to accomplish similar goals. Authors will be encouraged to make key underlying data publicly accessible. Online scientific notebooks, including protocols are to be handled similarly. In each case, deep machine algorithms will link related data to relevant publications forming a user-friendly semantic network. There are great benefits of such a system to preventing or uncovering scientific fraud and carelessness as well as promoting a more collaborative approach to science. In Bio 2.0, scientists directly interact, exchange raw data, notebooks and ideas, collaborate, network, seek funding, build upon their own and others prior work in a structured way, identify important trends, and commercialize worthy ideas. Bio 2.0 aims to be a democratized Facebook of science (without some of its associated problems), not dependent on the whims of private stockholders, but closely aligned with the interface between academia and commerce. To foster technological breakthroughs from basic science and vice versa, insight into both product commercialization and basic scientific research is necessary. A pervasive misconception in industry is that technological innovation requires only applied science. While fundamentally true, the underlying basic science is necessary to understand, develop, and optimize technology. This is especially true in biotechnology, where startups often fail for misevaluations on product readiness and when the underlying basic science poses difficult and unrecognized issues. The systemic problem is that basic research groups and biotechnology commercialization and research development teams have a limited, and often, incorrect understanding of each other. Ironic, given that biotechnologists often began their careers in academia. In academia, there is a dichotomous perception of the commercial application of basic science. On the one hand, financial remuneration from application of basic discoveries is strongly encouraged, while on the other, elite scientists are often disdainful of financially successful scientists. Consequently, an individual harboring both academic and commercial acumen is extremely rare. 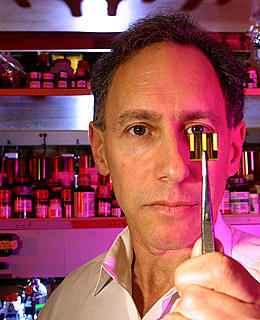 The exception that proves the rule is Robert Langer of MIT who has launched over two dozen start-ups and licensed his patents to over 200 companies. He is an outlier, an example of an academic entrepreneur. However, not all world class scientists have the insight to determine what is a good entrepreneurial opportunity. Changing the academic scientific culture to intellectually value entrepreneurship and technology development is already occurring. We believe the Bio 2.0 metajournal/social network will further promote this important revolution. Another great challenge is to destigmatize high risk exploratory research designed to answer big questions. In 2011, the National Institute of Health, the major governmental granting agency, sponsored the “Independent Scientist Award”, focusing on early career outstanding scientists. Great scientists like Fred Sanger and Francis Crick, need not have applied for this award, because they required years of work before achieving success. If no major funding exists for young “thinkers” and “dreamers” in science, what chance is there for the birth of their revolutionary technology? In an age where funding has become formulaic, where “innovation” equates to “incremental improvements” and truly innovative proposals are returned with sarcastic reviews of impossibility, history has been long forgotten. For many individuals, the greatest barrier to scientific innovation – besides lack of insight – is funding. Throughout history, extraordinary individuals with vision have required years of incubation before their work reaches its fruition. A “casino fund”, aptly proposed by Nobel Laureate Sydney Brenner, is necessary to potentiate important discoveries by scientific visionaries. With the BioInnovators Fund, we hope to fulfill this critical absence by funding scientists with great potential, creating a support network, and facilitating the publication of the critical hypotheses that underlie works in progress. With the help of emeritus scientific luminaries, the Bio 2.0 Foundation will seek out renascent Independent Scientist Explorers (rISE) as BioInnovators. These three initiatives will synergistically effect meaningful change in scientific institutions and culture, accelerating progress and resulting in extraordinary social benefits. We understand that the Bio 2.0 Foundation will not accomplish these lofty goals on its own or in a short time period: significant reform requires extended time. We welcome the assistance of interested parties and anticipate cooperating with similar such initiatives to reach these important goals .